Violent clashes erupted after police forced their way into a building occupied by squatters across the street from a new Tesco shop. NINE PEOPLE HAVE BEEN arrested following overnight rioting in Bristol, England, in which eight police officers were injured. A number of protesters were also injured and required hospital treatment, according to police. The trouble erupted when police arrived in the Stokes Croft area and forced their way into a building used by a group of squatters, opposite a Tesco Express store. Bristol24-7 reports that the police action drew anger from local residents, who turned out in their hundreds. A small number of them began throwing bottles at police before focusing on the Tesco shop, smashing its windows. Police had earlier removed protesters from outside the store. Today, the Avon and Somerset police said their overnight actions to tackle the trouble “were fully justified”. They said police were trying to arrest four people who represented “a very real threat to the local community”. The BBC reports that police carried out the raid on the squatters’ premises because they feared the Tesco store would be attacked by petrol bombs. In their statement this morning, police said they had recovered some petrol bombs and would be examining them forensically. 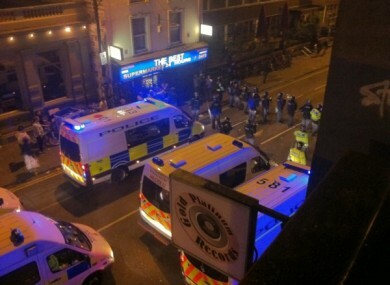 The police operation involved around 160 officers. Email “Riots erupt in Bristol as police raid property used by squatters (videos)”. Feedback on “Riots erupt in Bristol as police raid property used by squatters (videos)”.